1. The crawler bulldozer utilizes an engine with NationalⅡemission standard, and is energy efficient and environmental friendly. 2. 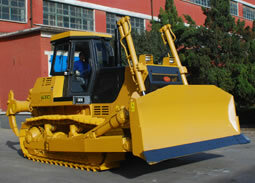 Using the American Donaldson air filter and postfilter device, the crawler bulldozer comes with prolonged engine life and increased maintenance interval. 3. The engine muffler, with ejector device removed, is designed with improved exhausting system, which allows the crawler bulldozer to have reduced exhaust pressure and reduced fuel consumption. 4. A sealing mechanism is adopted to isolate the cool and hot air for the cooler, thus improving the heat dissipation performance of the cooling system. 5. The hydraulic filter of the crawler bulldozer comes with an alarming device, so as to timely remind users cleaning filter element or replacing hydraulic oil. 6. Air conditioner is available under the engine hood, which allows the bulldozer to increase cooling effect by making use of the cool air flow from the engine. 7. Designed based on user-friendly design philosophy, the crawler bulldozer is easy for maintenance and repair. 8. Preposed oil cylinder can reduce the stress on oil cylinder and engine head. This also makes engine repair and maintenance simple and easy.